Trump administration adviser Johnnie Moore denied the claims of a former White House staffer that the evangelical advisory board has not provided critical feedback to the president. Cliff Sims, former White House director of message strategy, will have a new book released on Tuesday titled Team of Vipers: My 500 Extraordinary Days in the Trump White House. In the book, Sims takes issue with President Donald Trump’s evangelical advisory board, officially named the Faith Leaders Initiative, stating that he never recalled “any of the faith leaders who actually had access to Trump” push him on the issue of asylum for persecuted Christians. Sims says that Trump promised evangelicals he would help, but never kept that promise. Instead, Trump followed the advice of White House senior adviser Stephen Miller, who said, "I would be happy if not a single refugee foot ever again touched America's soil," according to Sims. Sims "never heard" any of Trump's faith leaders press him on the refugee issue, he added. In September, the Trump administration announced it would reduce the cap on refugees allowed under the U.S. Refugee Resettlement Program from 45,000 to 30,000. Some evangelical leaders had asked the administration to increase the cap, given that there are 25 million refugees fleeing persecution worldwide. In comments given to The Christian Post on Monday, Moore, founder and CEO of The Kairos Company, a public relations and communications consulting firm, denied the claim that the spiritual advisers to President Trump did not give critical feedback. “Honestly, I nearly laughed when I read it because moments before I did, I received a phone call from a very well-known evangelical who had just left the Oval Office where they had a very dynamic discussion,” said Moore, who is also a senior editorial adviser for CP. “Because of where he worked and the level at which he worked in the White House when the engagement of evangelical leaders with the president, and those closest to him, has been direct to the president, vice president and through certain highly placed senior advisers,” continued Moore. Moore’s comments to CP echo those he made in May of last year when he was part of a panel discussion at Georgetown University about the role of faith in the Republican Party. Moore mentioned during the panel discussion last year that the evangelical leaders have not been afraid to voice their disagreements or concerns. Regarding Trump’s view of Team of Vipers, Politico quoted unnamed sources within the White House saying that Trump is “very p---ed off” and “hopping mad” at Sims. 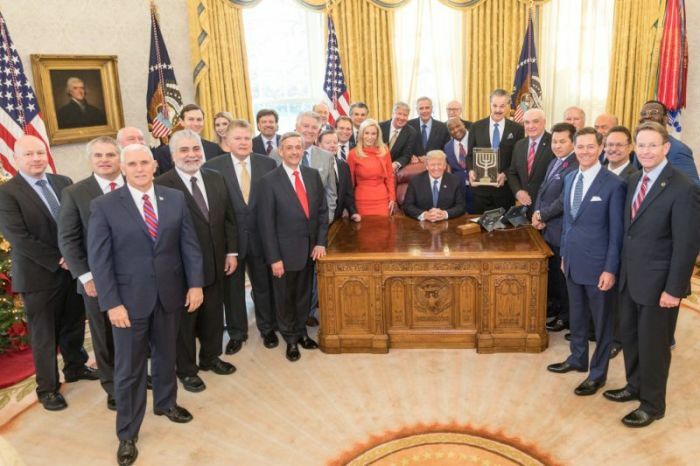 The association of some evangelical leaders with Trump has been controversial throughout his presidency. For example, writing about the alliance recently for The Washington Post, Michael Gerson, an evangelical who worked in the George W. Bush administration, said, "The employment of an unethical, racist, anti-immigrant, misogynist Giant [Trump] is not likely to play well with women, minorities and young people, who are likely to equate conservative religion with prejudice for decades to come."